I had been asked by the Threads of Life organization – a Canadian charity that provides support to families of workplace tragedies – to attend a press conference at the British Columbia Parliament Buildings in Victoria. The purpose of the press conference was to announce a working partnership between Work Safe BC and Threads of Life, as well as raise awareness about the importance of workplace safety. So I attended the press conference, along with several other family members who have been impacted by a workplace fatality, serious injury or occupational illness. The media event took place in a secure section of the building – so unless a person had been specifically invited (or was authorized to be there), they wouldn’t be in attendance. So basically, in the room were: people from Threads of Life, some family members, the media and several government representatives. Now, also happening near Victoria on that same day – at the exact same time, in fact – was the police funeral for RCMP officer Const. Sarah Beckett, 32, who had been killed in a car crash. Sarah left behind a husband and two young children. The press conference started and the first person to speak was a senior provincial government representative. She started off by commenting about the importance of the work that Threads of Life is doing in the community – both in terms of raising awareness about the need for a reduction in workplace fatalities, injuries and illnesses, as well as their commitment to supporting individuals and families who are coming to terms with a workplace tragedy. But the guy beside me just kept on scrolling through his e-mail. Strike one, buddy: I’m a family member of a loved one who died as the result of an easily preventable fall at an unsafe workplace. The speaker, clearly emotionally impacted, then went on to say a few words about how her thoughts were with the family and friends of Const. Beckett – and how the public appreciates the ultimate sacrifice the officer made. The guy beside me just kept on scrolling, eyes glued to his phone. Strike two: I’m the widow of a police officer who died in the line of duty. We didn’t get to strike three. The next thing I knew, I wound up my arm and jabbed my elbow sharply into his arm – the one holding the phone. He turned and looked at me, livid. “THAT IS RUDE!” I hissed back. He gave me the stink eye – and then immediately put his phone away. And as soon as the conference ended – it lasted a whopping 15 minutes – he got up and left the room. So I sauntered to the back of the room and had a little chat with the nice gal who had given me some water prior to the press conference. I told her about the elbow jab and pointed to the chair the guy had been sitting in. Her eyes grew wide as saucers. By that point, I had returned to my usual self – not wanting to rock the boat…don’t want to get anyone in trouble. So that was that. If he didn’t get the message when I jabbed him with my elbow, he was going to get it from his supervisor. And what, exactly, WAS the message? 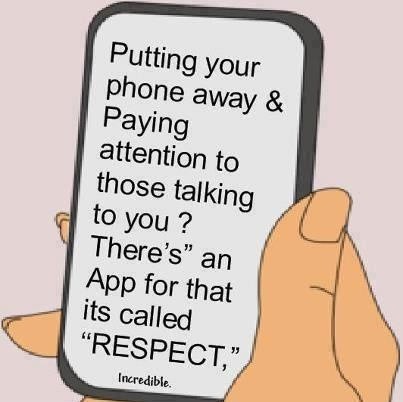 That there is a time a place for scrolling through one’s cell phone – and if you are supposed to be paying attention to what is actually happening around you in real life, then pay attention…if not for yourself, then out of respect for others. Then, on the drive home, I was listening to the radio and heard a clip from the eulogy given at Const. Sarah Beckett’s funeral. One of Sarah’s old supervisor’s delivered the heart-breakingly beautiful eulogy and he was talking about how Sarah didn’t take guff from anybody. If something needed to be said, she said it. She wasn’t afraid to speak up. I looked to the sky and smiled. 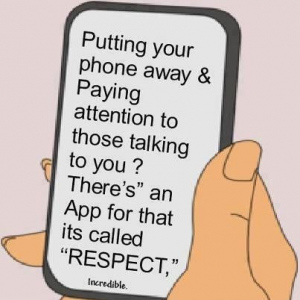 I agree that cell phone etiquette has to be taught, because to some people good cell phone manners are not obvious. We try to teach our teens: no phones at the dinner table, do not look at your phone when someone is chatting with you, never have your phone near you when driving. My husband just recently made a few hours of the evening “cell phone free”. What I worry is that young people (and adults) are plugged into their phones + social media ALL day. They never get to turn off their minds. They are even allowed their cell phones in junior and senior high school classes (which I find amazing. How does a teacher actually reach the kids when they’re constantly checking their phones?) Not to mention the cheating that goes on with cell phones in school. It’s routine that kids will snap photos of a test and send it to their friends who take the test later in the day. Or even google answers for a test when the teacher isn’t looking. And I think this cell phone habit leads to young people always comparing themselves to others: What is this person doing? Why am I left out of this activity they’re putting on instagram? Are they having more fun than me? How about their latest instagram selfie – Is it better than mine? Young people seem to be growing up thinking how many likes and compliments they get on their photos is a measure of success. This worries me for their long term emotional/mental health. Also: the obvious – if we are constantly plugged into our phones, how are we possibly developing healthy relationships, or basic people skills?